When we decided to go for the vintage Tele® sound, we knew we had to do more than just copy a forty-year-old design. We wanted pickups that captured the best elements of our favorite Broadcaster® and Telecaster® sounds — and then some. 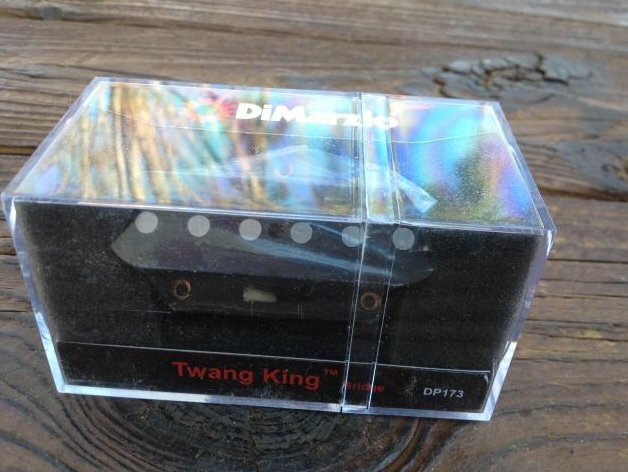 The Twang King™ pickups have unequalled response to pick attack: light playing produces a soft, quiet tone and hard picking creates a harder, louder, and more dynamic sound than any comparable single-coil. We accomplished this with a combination of controlled-tension coil-winding, special wire, and hand-calibrated magnets. The neck pickup comes with a chrome cover, and the bridge model has a ferrous base plate. Both pickups are wax-potted twice for squeal-free performance. We didn't model the Twang King™ bridge after a specific original. Instead, we combined the best tonal qualities of several Broadcaster® and Telecaster® pickups from the 50s and early 60s. We were aiming for a balance between big, clean lows and fatter-sounding highs, and we wanted the pickup to be able to handle a very wide dynamic range, so the sound would clean up with soft picking and really open up with a harder attack.